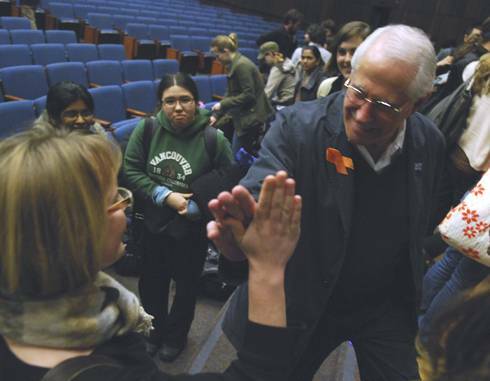 Democratic candidate Mike Gravel gives freshman Hannah Jewell a high five after speaking to the Political Science 179 class Wednesday afternoon in Wheeler Auditorium. Listen to an abbreviation of Sarah Morrison's interview with Mike Gravel, Democratic presidential candidate. As the excitement of Super Tuesday draws to a close, UC Berkeley welcomed Democratic presidential candidate and former Senator Mike Gravel to address political science students yesterday afternoon. Gravel spoke to students of Political Science 179 in a packed Wheeler Auditorium, outlining his election campaign and answering questions on the current state of American politics. After gaining just 0.1 percent of California's Democratic vote on Tuesday, Gravel said that he will be remaining in the race until the end. "I have no desire to live in the White House," he told the students. "However, I do have a desire to turn around and change your lives politically." Gravel began by outlining his national initiative, which he said would empower every American citizen with the ability to make their own laws. "I am trying to change the paradigm of human government," he said to the crowd. "The premise is to have unreserved faith in the people and not just in the minority that have ruled us for so long." Under his plan, Gravel said he would like to improve education, health and the environment, areas which he said are overlooked in favor of military spending. "While the recent budgets for education and health care have both been cut, military spending has increased by 7.5 percent," he said. "That gives you an idea of our misplaced priorities here." Some students said that while Gravel's ideas were overly ambitious, many of his ideas reflected changes that need to be made. "There are some ideas that I personally don't think are feasible, but he was spot-on in terms of the military-industrial complex," said sophomore Rishi Malhotra. As an anti-war candidate, Gravel has shown his support for Berkeley citizens against military recruitment centers. "I am proud to be here and to endorse the process and if you don't want any more recruitment in Berkeley, then more power to you," he said. To fund universal health care and an improved national education system, Gravel said he would abolish income tax and the current Internal Revenue Service in favor of a national sales tax. Gravel also promised to remove all American troops from the Middle East in 120 days if elected and said that he could establish peace between Israel and Palestine. While some students questioned the extent of Gravel's plans, he received cheers throughout his speech and was often interrupted by loud clapping. "The students were much more engaged than I expected," said Political Science Professor Alan Ross. "Students are hungering for someone who will really address the issues that other candidates won't."